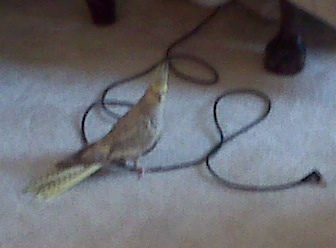 I have this bird named Missy. I know. Who has a bird for a pet? Let’s rewind this. Who has a bird for a pet that is supposed to live 25 years? 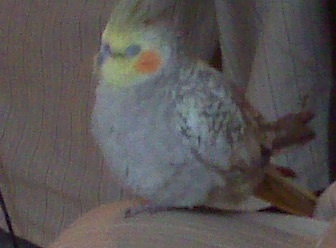 I love this bird like she is my little baby. She is so awkward, so fussy, so impeccably me that sometimes I find I should just start telling people about her little life instead of bashfully ignoring her presence. She’s needy, she likes routines, she runs around on the floor like a maniac, she poops every 15 minutes, the feathers on her head are always a mess, she almost always looks stressed out, she waddles, she likes men more than women, taller rather than shorter, she grinds her beak a lot, she absolutely hates going to the vet, she doesn’t like the confines of her cage, she performs mating rituals a couple times a week, she cleans herself in the shower, she sleeps on one leg with her head tucked into her wing, she’s endlessly inquisitive, and she’ll eat anything you put in front of her…except ants. We just moved into our new apartment- Missy & I. She sits in her crowned cage at the end of the kitchen island, furthest from my room and the back door. The other night, I was reading in my room and heard a tiny pitter-patter from the countertop; I looked up to see her little frame curiously cocking her head towards the light spilling out of my room. I laughed and brought her in when I realized she needs a friend, too. She is so predictable. She freaks out every time I start the brand new computerized washer & dryer ….bracing herself with one foot on the branch & the other against the side of the cage. This is the stance of a bird who is in serious peril. Today, Bryan threw a fruit snack into her cage from about 15 feet away. She immediately became ‘skinny’ and grew a mohawk. Later I return from the pool to find that my bird has purple ‘gummy’ all over her beak…like I won’t know she attacked the fruit snack. And I love watching her desperately try to walk across the carpet towards me when there are ants…you would think they were dragons. As crazy as she is, I think we get each other.